Stuff Points: Earn 80 points when you buy this stuff. This innovative indoor fountain is both a water fountain and a misting device all in one. Relaxing sounds of natural running water combine with a gentle cloud of mist and a mezmerizing light show to create a magnificent indoor water feature. Add to that the lighted rolling ball system, and it makes for an extremely captivating addition to any home or office. Choose from three different styles featuring variations in rock and bowl color. You are sure to find one that fits perfect with your decor. A powerful rock formation emerges from an elegant glass bowl. With unique stlying that gives the look of real stone, the mountain formation creates the perfect medium for the water to trickle down. Included vegetative accents round out the look of this deluxe indoor fountain. The upper pool is home to a glowing orb that gently rotates as water is pumped up from beneath it. A misting device that is submerged in the water creates a natural cloud that gently floats on top of the water and then wafts over the edge. With Water cascades from beneath the gently spinning orb, and trickles down the rock face below. A continuous cycle of running water generates calming background noise, and the faux-stone finish is timelessly elegant. Relax to the soft sounds of trickling water. It will soothe your mind, body and spirit, leaving you calm and rejuvenated. This magnificent indoor fountain, with its beautifully detailed design, is constructed from strong, yet lightweight materials and finished off with a natural weathered stone look. 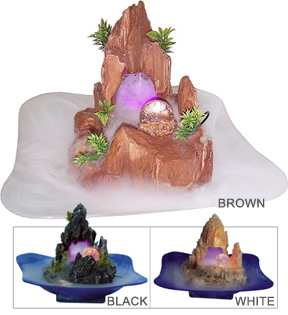 A feng shui water feature that will promote a calm and relaxing atmosphere in any room you put it in. This 12-inch high fountain includes the pump, mister and everything else you need. A long lead and standard three-prong cord allow you to plug this fountain in anywhere. Lightweight, yet sturdy fiberglass constructions gives this fountain the look of natural stone without the cost or weight. Because this item is made to order and hand-finished, color may vary slightly. Order Yours Today! Dimensions (L x W x H) 14" x 14" x 12"
The Mountain Waterfall Fountain - Perfect for any indoor space. This uniquely styled fountain and mist maker will enhance the decor of any home or office. Lightweight materials and a small footprint make it easy to place it almost anywhere. Order Yours Today! Do you sell the power pack alone? A Gothic Inspired Fountain With Integrated Misting Device. A Large Table Top Misting Fountain With Wavy Bowl. Tabletop Mister With Multi-Colored, Floral Bowl. All Glass Fountain Model With Hexagon-Shaped Bowl, And Matching Stand.